When the twelve-year-old Sergei Rachmaninov became a piano student of Nikolai Zverev at the Moscow Conservatoire, the boy played duet transcriptions with fellow pupils as part of his general musical education. Tchaikovsky heard and commended them, and (probably inspired by his encouragement, and without instruction) in the summer of 1886 Rachmaninov began his first work as a composer: a piano-duet transcription of Tchaikovsky’s ‘Manfred’ Symphony, now lost. But Rachmaninov continued to transcribe music for the piano, and a selection is recorded here. This album also includes a transcription of Rachmaninov’s Vocalise—the quintessence of the composer’s melodic genius—arranged by Zoltán Kocsis. When SergeI Rachmaninov was born in April 1873, the concept of creating permanent recordings was exercising the minds of two remarkable, yet uncon­nected, inventors—the American Thomas Alva Edison, and the Frenchman Charles Cros. By the time of Rachmaninov’s death, a few days before his seventieth birthday, Cros’ theory and Edison’s practical research had become a worldwide industry, which even by then had led to stereophonic recor­dings, long-playing records and tape and wire recording—although these advances had to wait until after World War II for their commercial development. In some ways, Rachmaninov welcomed modern inventions: in pre-revolutionary Russia he acquired a telephone and a fine motor car, but he came to dislike the former. In 1919, he made his first records—in the USA, for the same Thomas Edison who in 1877 had achieved the earliest practical recording. A short while later Rachmaninov became an exclusive Victor artist and an enthusiast for the gramophone. He might have made more records had not RCA Victor’s subsequent classical director Charles O’Connell disliked him personally and rejected many of the artist’s suggestions. Nevertheless, Rachmaninov’s recorded legacy (including piano rolls) totals some fifteen hours. Within his lifetime he had witnessed the universal growth of passive home entertainment, for by the early 1940s radio broadcasting had joined recording as a medium of instant global communication. Seventy years after Rachmaninov’s death, stored information can be retrieved quickly and relatively cheaply. Short of com­plete disaster, the notion of being without these means of modern communication is unthinkable, yet the world into which Rachmaninov was born and grew up lacked such contrivances. A child in those days could learn music largely only through playing it. In addition to solo piano arrangements, transcriptions for two pianists at one piano of orchestral or even chamber music were the principal way by which either children or adults got to know these compositions, for concerts were then comparatively rare events. One of Rachmaninov’s earliest childhood memories was of playing piano duets with his grandfather Arkady who, as a young man, had taken lessons from the Irish pianist and composer John Field. So when, on the recommendation of his cousin Alexander Siloti (who had been a Liszt pupil), the twelve-year-old Sergei Rachmaninov became a piano student of Nikolai Zverev at the Moscow Conservatoire, the boy played duet transcriptions with fellow pupils as part of his general musical education. The great Tchaikovsky heard and commended them, and (probably inspired by his encouragement, and without instruction) in the summer of 1886 Rachmaninov began his first work as a composer. This was a piano-duet transcription of Tchaikovsky’s ‘Manfred’ Symphony, then recently published by Jurgenson (the Symphony was premiered on 11 March: it is likely Rachmaninov was present). This transcription was the kind of practical musicianship which the boy needed to supplement his lessons in piano and harmony. Rachmaninov and a fellow-pupil played the transcription to Tchaikovsky, and the com­poser must have been intrigued by the boy’s work. Whether we would be impressed with this first effort remains conjectural, for the transcription is lost. From his earliest musical encounters therefore Rachma­ninov regarded transcriptions as a normal part of music-making. Some editions of his own later works, thought to be ‘transcriptions’, are in fact the original versions. More often than not, particularly with regard to his operas, Rachmaninov orchestrated these ‘original versions’—a usual working method for opera composers. As Rachmaninov was also a superb pianist, and was director of the Bolshoi Opera, a greater interest than is customary lies in the vocal scores he published of his operas—especially with regard to the purely orchestral items: overtures, entr’actes, intermezzos or dances. They are piano transcriptions of a high order, akin to the composer’s first drafts. In this regard, the fifteen-year-old Sergei Rachmaninov planned his first opera, Esmeralda, after Victor Hugo’s novel Notre-Dame de Paris—in October 1888. It remained unfinished but the Introduction to Act I and an entr’acte (with other music) survive in piano score. Three years later, at Siloti’s suggestion (and under his supervision) Rachmaninov arranged Tchaikov­sky’s The Sleeping Beauty for piano duet. This was issued in 1892, a year that saw Rachmaninov’s vocal score of his opera Aleko published, with its Introduction, Intermezzo and Dances. 1892 also saw him write a work for piano duet which first appeared in orchestral form two years later: the Caprice bohémien, Op 12. The view that the piano duet version is a transcription is untrue but Rachmaninov’s next three duet arrangements were done after the orchestral scores, in common with the normal practice of issuing orchestral works in duet versions for domestic use. In 1893 he made a duet version of The Rock, his orchestral fantasy Op 7; two years later, one of his ill-fated First Symphony (prior to its single, disastrous, performance in Rachmaninov’s lifetime) and, ironically, a duet version of Glazunov’s Sixth Symphony, Op 58 (Glazunov had conducted the unhappy premiere of Rachmaninov’s Symphony in March 1897). The Glazunov was Rachmaninov’s last piano duet transcription. It is often thought the failure of his Symphony plunged the composer into a period of self-doubt from which he only recovered three years later after a course of hypnotherapy. But Rachmaninov’s life as a performing musician during this period was so hectic that he had little time for composition even had he wished. He declined invitations for new works, including one for a Second Piano Concerto, as his post as director of the newly formed Mamontov Opera Company took most of his time—he conducted six operas in the first season, including the Russian debut of Bizet’s Carmen. His growing international reputation—fuelled by the fame of his C sharp minor Prelude—led him to accept an invitation from the Royal Philharmonic Society of London in 1899. After a notable Queen’s Hall appearance he promised to return the next season with a new concerto. But the following year, after composing a few short pieces, Rachmaninov’s muse would not respond; for several reasons he had become depressed and he agreed to visit Dr Nikolai Dahl, a pioneer hypnotherapist. The treatment worked: the new Concerto was well-advanced by the time Rachmaninov made the first of his transcriptions for solo piano, the Minuet from Bizet’s L’arlésienne Suite No 1, dated 13 September 1900. This was not published until 1950. Rather more puzzling is that Rachmaninov made another transcription of the Minuet over twenty years later which was published in 1923. This second transcription is the one recorded here. The first version has different harmonies and melodic lines—rather closer, in fact, to Bizet’s original. Rachmaninov never played his first solo piano transcription in public; in 1908, he composed the first act of another un­finished operatic project, to Maeterlinck’s Monna Vanna, which exists only in unpublished piano score, including the Prelude. Rachmaninov regarded his Monna Vanna music highly but contractual problems prevented its completion. Three years later, in March 1911, Rachmaninov wrote his Polka de W R (Vassily, or Wassily, Rachmaninov, his father)—a tune which his father often played on the piano. For many years this was thought to be an original theme by Rachmaninov senior: in fact, it is ‘Lachtäubchen’ (‘The little laughing dove’) by Franz Behr, a famous 19th-century salon composer, whose waltz ‘Les sylphes’ was highly popular. Perhaps Behr can be blamed for the uncertainty of the work’s origin: he used several pseudonymns—English, French, Italian, and so on—for his music. Rachmaninov’s ‘innocent transcription’ of this piece was published in 1911 in a book of short pieces with contri­butions by Medtner, Scriabin and Taneyev; Rachmaninov made the first of his several records of the piece during his intial sessions for Edison eight years later, showing his affection for the trifle. Following his marriage in April 1902 Rachmaninov pro­duced an important group of songs, Opus 21, completing them in Lucerne during his honeymoon. Eight years later, on his return to Russia after his first American tour, an anonymous lady (later identified as Mme Fekle Rousseau) sent him a bouquet of white lilacs. She signed the card ‘The White Lilac Lady’. They never met, but thereafter she sent an identical bouquet to all his concerts—even those abroad. Lilacs and roses adorned the gate leading to the front door of Rachmaninov’s country estate at Ivanovka. The flowers bloomed beautifully during the idyllic summer of 1914. Rach­maninov’s solo piano transcription of his song Lilacs—the fifth of his Opus 21—appeared by the end of the year, in the wake of Germany declaring war on Russia on 1 August. No artist could have remained untroubled by the uncertainties the outbreak of hostilities brought; here was a time for remi­niscence, a time to transcribe this meaningful and beautiful song for piano. Rachmaninov recorded this as well, but in 1941 (in not dissimilar circumstances) he made another version of the transcription, which he also recorded. In this second version, recorded here, Rachmaninov’s changes are slight: a few notes here and there, and six alternate bars. In either version, this is a haunting piece. The Great War went badly for Russia: by the end of 1917 two revolutions had led to the fall of the Romanovs and the rise of the Bolsheviks under Lenin, who took the country out of the war at the Treaty of Brest-Litovsk. The old order was swept away, and with it Rachmaninov’s familiar artistic milieu—to say nothing of his country estate. With his family and few possessions, he left Russia: after living for a while in Scandi­navia, they arrived in New York City on Armistice Day, 1918. He made his debut in the USA as an American resident with a recital later in November in Providence, Rhode Island. At a second recital in Boston on 15 December, he premiered his arrangement for piano solo of John Smith’s ‘The Star-Spangled Banner’. This was unpublished: the manuscript is lost, but Rachmaninov recorded it for the Ampico piano roll company in 1919 at about the same time as the Edison discs which included his only recording of Liszt’s Hungarian Rhapsody No 2. The Liszt Rhapsody includes a cadenza, taken down from his records and published after Rachmaninov’s death. He never wrote it out in full. By 1921, Rachmaninov’s ‘new’ career as a touring virtuoso had been well established; he was now recording exclusively for the Victor company (under better conditions than Edison could offer). Fritz Kreisler and John McCormack, fellow Victor artists, recorded two of the composer’s songs with violin obb­ligato on 2 April, 1920; Rachmaninov was so taken by the disc that he arranged a Russian folk song for McCormack and arranged Kreisler’s famous Liebesleid for solo piano, which he recorded for Victor in 1921. Almost a year later he returned to the Bizet L’arlésienne Minuet and made his second version; this was published in 1923. This new version shows the composer’s move towards a leaner keyboard style. The same year, 1923, Rachmaninov transcribed the Hopak from Musorgsky’s opera Sorotchinsky fair for solo piano (both Bizet and Musorgsky had made piano versions of their own pieces), but he did not write this down until January 1924—after his first recording of it, for Ampico (his Victor disc was made in 1925). Rachmaninov also arranged the Hopak for violin and piano, no doubt with Kreisler in mind, but this remains unpublished. Also possibly in 1924 (the manuscript is undated), he transcribed Daisies—the third of his last group of songs (Opus 38 of 1916)—which echoes a phrase from the second Piano Concerto. This may have been an encore item; in 1925 Rachmaninov made a companion transcription to Liebesleid, Kreisler’s Liebesfreud, which he also recorded the same year. Returning the compliment, Kreisler arranged Rachmaninov’s Daisies for violin and piano. 1925 also saw Rachmaninov’s transcription of Schubert’s Wohin? from Die schöne Müllerin, which he premiered at a recital in Stamford, Connecticut, that October. In 1929, Rach­maninov made his final Ampico rolls: the sessions included his new transcription of Rimsky-Korsakov’s The flight of the bumblebee, from the opera The Tale of Tsar Saltan. This was not published until 1931, the year of Rachmaninov’s last origi­nal solo piano work, the Variations on a theme of Corelli, Op 42, which he dedicated to Kreisler. By then, Rachmaninov’s habit was to make a solo piano arrangement and not publish the piece until after he had played it publicly several times. This was the case in 1933 with his next arrangements, perhaps his most famous, the Scherzo from Mendelssohn’s music to A Midsummer Night’s Dream, and a suite of three movements from Bach’s solo violin Partita in E major. With his Bach and Mendelssohn arrangements Rachma­ninov’s transcriptions virtually ceased. Perhaps the rise of radio and recording indicated that times had changed; in any event, his final masterpieces were to occupy him during the next few years. But in 1934 he wrote a solo piano version of the ‘Nunc dimittis’ from his All-Night Vigil Op 37—the facsimile appeared in a book of reminiscences—but this transcription has never been issued separately; it is uncertain he ever intended it for public performance. The outbreak of World War II found Rachmaninov at home in America; reminiscences—notably those in his last original composition, the Symphonic Dances of 1940—resurfaced. That same year had begun with revisions of several original pieces, the Moment musical, Op 16 No 5, the Mélodie and Sérénade from Op 3 (Nos 3 and 5) and, dated 3 March, his Humoresque, Op 10 No 5. As with the new version of Lilacs, which appeared later, most of these were done prior to being recorded by him for RCA Victor. The year 1941 saw the war in Europe spreading rapidly. Hitler ordered the German invasion of Russia on 22 June, and Rachmaninov—deeply concerned that his country was again at war—decided to devote the proceeds from his forthcoming concert season to the Red Army. Who would not think of one’s homeland at such a time? And of one’s formative and peaceful years there? Fifty-five years before—in another country, an­other continent, another culture, another century—the thirteen-year-old Sergei Rachmaninov began his composing career with a Tchaikovsky transcription, the ‘Manfred’ Symphony for piano duet. On 12 August 1941 the world-famous Sergei Rachmaninov ended his composing career with a transcription for solo piano of Tchaikovsky’s Lullaby (Op 16 No 1). Rachmaninov’s first recordings for Thomas Edison inclu­ded transcriptions; his last sessions, in February 1942, included his Bach Suite and a new version of Liebesfreud, together with arrangements by Liszt and Tausig—and, finally, his version of Tchaikovsky’s Lullaby: transcriptions all. Thus did this great artist’s composing and recording careers begin and end with Tchaikovsky—and with transcriptions. Rachmaninov’s record of the Lullaby transcription remained unissued by RCA until it appeared in 1973 as part of a commemorative set to mark his centenary, the celebrations of which have since led to the rehabilitation of almost all of Rachmaninov’s music—including that for solo piano, the instrument of which he was such an incomparable master. Since the Rachmaninov centenary, it has become the custom rather than the exception for pianists who specialize in music of his time to perform all the Rachmaninov concertos for piano and orchestra. Among the more gifted of such players is Zoltán Kocsis, who recorded them in 1984; later, Kocsis transcribed one of the composer’s most famous melodies, the wordless Vocalise which was originally published as Op 34 No 14 in 1916 (the other songs of the Opus had appeared three years earlier). Rachmaninov never transcribed this haunting melody for piano solo, which is somewhat surprising as he would have first ‘tried it over’ at the keyboard, and he subse­quently made transcriptions of the theme for soprano and orchestra and for full orchestra, and appears to have sanctioned several others. 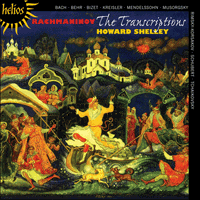 In many ways, the Vocalise is the quintessence of Rachmaninov’s melodic genius, and Howard Shelley’s album ends fittingly with an arrangement by one fine Rachmaninov pianist, in tribute to the composer, played by another. Quand Serguéï Rachmaninov naquît en avril 1873, deux inventeurs remarquables mais d’origine différente s’occupaient déjà de l’idée de faire des enregistrements permanents de la musique: l’américain Thomas Alva Edison et le français Charles Cros. Lorsque le compositeur mourut, peu de temps avant son soixante-dixième anniversaire, la théorie développée par Cros et les recherches pratiques d’Edison étaient devenues la source d’une industrie mondiale, qui déjà à cette époque avait produit des enregistrements stéréo­phoniques, les disques microsillons, les enregistrements magnétiques et à fil, bien que ce n’est qu’à la fin de la seconde guerre mondiale que ces innovations purent se montrer rentables. De quelques façons, Rachmaninov se réjouissait des in­ventions modernes: dans la Russie pré-révolutionnaire, il avait acquis un téléphone et une voiture splendide, mais il en vint à mépriser le premier. En 1919, il fit ses premiers enregistrements—aux États-unis, pour ce même Thomas Edison qui avait réalisé les premiers disques praticables. Un peu plus tard, Rachmaninov signa un contrat d’exclusivité avec la compagnie RCA Victor et devint un passionné du phonographe. Il aurait dû faire beaucoup plus d’enregis­trements si le prochain directeur de RCA chargé des enregistrements de la musique classique, Charles O’Connell, ne l’avait pas pris en grippe et rejeté la plupart des suggestions qu’il faisait. Néanmoins, il nous reste un héritage considérable d’enregistrements par Rachmaninov: presque quinze heures, si on y comprend les rouleaux de piano. Au long de sa carrière, il avait été témoin du développement du loisir domestique, car pendant les années 40, les émissions de radio utilisaient déjà les enregistrements de disques comme moyen de communication musicale. Soixante-dix ans après la mort de Rachmaninov, l’information stockée peut être extraite à peu de frais et assez rapidement. À moins d’un désastre complet, on ne peut pas envisager un monde sans ces moyens de communication modernes, mais le monde dans lequel Rachmaninov était né en manquait totalement. À cette époque, un enfant ne pouvait apprendre la musique qu’en la jouant. Le moyen principal, pour les enfants comme pour les adultes, de se familiariser avec la musique d’or­chestre, ou même avec la musique de chambre, était de jouer au piano des transcriptions à deux ou à quatre mains, car les concerts n’avaient lieu qu’assez rarement. Rachmaninov se souvenait dans son enfance d’avoir joué à quatre mains avec son grand-père Arkadi, qui, jeune homme, avait étudié le piano chez le pianiste et compositeur irlandais John Field. Lorsque, recommandé par son cousin Alexandre Siloti, (ancien élève de Franz Liszt), le garçon Serguéï Rachmaninov, âgé de douze ans, devint élève de Nikolai Zverev au Conser­vatoire de Moscou, il jouait des transcriptions à quatre mains avec ses camarades comme partie de son éducation musicale générale. Tchaïkovski les entendit et les loua, et, pro­bablement inspiré par ses encouragements et sans instruction, Rachma­ninov entama durant l’été 1886 sa première œuvre en tant que compositeur. Il s’agissait d’une transcription de la Symphonie «Manfred» de Tchaïkovski, qui venait de paraître chez Jurgenson. (La première de la symphonie eut lieu le 11 mars; il est probable que Rachmaninov y assista.) Cette transcription fut une tâche du genre pratique dont le garçon avait besoin pour compléter ses études de piano et d’harmonie. Rachmaninov et un camarade jouèrent la transcription à Tchaïkovski, lequel a dû être intéressé par le travail du garçon. On ne peut pas juger de la qualité de l’œuvre car la transcription est perdue. Dès ses premières expériences musicales, Rachmaninov considérait les transcriptions comme moyen normal de faire de la musique. Quelques éditions de ses œuvres, qu’on a toujours considérées comme des transcriptions, sont en fait les versions originelles. Le plus souvent, en particulier pour ses opéras, Rachmaninov instrumentait ces «versions originelles»—méthode habituelle aux compositeurs d’opéras. Comme Rachmaninov était un pianiste superbe et le chef d’orchestre de l’Opéra Bolshoi, les partitions vocales de ses opéras (les morceaux orchestraux, c’est-à-dire les ouvertures, les entr’actes, les intermezzos et les danses, en particulier) sont beaucoup plus intéressantes que d’habitude. Ce sont des arrangements pour piano de haute qualité, comparables aux premières ébauches du compositeur. À cet égard, Serguéï Rachmaninov, âgé de quinze ans, conçut en octobre 1888 son premier opéra Esmeralda, d’après le roman de Victor Hugo Notre-Dame de Paris. Il reste inachevé, mais l’Introduction au premier acte et un entr’acte (avec une musique différente) ont survécu en partition de piano. Trois ans plus tard, à la suggestion de Siloti, et sous sa supervision, Rachmaninov arrangea La belle au bois dormant pour piano à quatre mains. Cela fut publié en 1892, l’an où Rachmaninov fit publier la partition chorale de son opéra Aleko, avec son Introduction, son Intermezzo et ses Danses. C’est aussi en 1892 qu’il composa une pièce pour piano à quatre mains qu’il instrumenta deux ans après: le Caprice bohémien, op.12. Cette version à quatre mains n’est pas une transcription; mais les trois arrangements suivants furent transcrits de partitions d’orchestre: c’était la convention de publier les œuvres orchestrales en transcriptions à quatre mains pour l’exécution privée. En 1893, il fit une adaptation pour piano à quatre mains de la fantaisie pour orchestre Le Rocher, op.7, suivie deux années plus tard de celle de sa première symphonie, œuvre malheureuse, qui ne fut exécutée qu’une seule fois pendant la vie du compositeur, et dont la première audition fut un désastre total. Puis, ironie du sort, il fit une transcription à quatre mains de la sixième symphonie, op.58, de Glazounov, qui dirigea la première exécution de la première symphonie de Rachmaninov en mars 1897. Ce fut la dernière transcription que fit Rachmaninov pour piano à quatre mains. Selon l’idée reçue, c’est l’échec de sa symphonie qui plongea le compositeur dans une période de doutes et il ne retrouva la santé qu’au bout de trois années de traîtement hypnothérapeutique. Mais à cette époque la carrière de Rachmaninov comme exécutant prenait un cours si trépidant qu’il n’avait guère le temps pour composer, même s’il le voulait. Il refusa d’écrire de nouvelles œuvres, dont une commande pour un deuxième concerto pour piano, car son poste de chef d’orchestre de la compagnie d’opéra Mamontov récemment créée lui prenait presque tout son temps—il dirigea six opéras lors de la première saison, entre autres la première russe de Carmen de Georges Bizet. Sa réputation internationale grandissante—alimentée par la renommée de son Prélude en ut dièse mineur—le mena à accepter une invitation de la Société Philharmonique de Londres en 1899. Après sa réussite remarquable au Queen’s Hall, il promit de revenir la saison suivante avec un nouveau concerto. Mais cette année-là, après avoir composé quelques bagatelles insignifiantes, Rachmaninov perdit son inspiration. Il souffrait d’une dépression, provoquée par diverses causes, et il consentit enfin à consulter le Dr Nikolai Dahl, pionnier dans le domaine de l’hypnothérapie. Rachmaninov réagit bien au traitement: le nouveau concerto faisait des progrès excellents cependant qu’il achevait sa première transcription pour piano seul, du Menuet de la Suite no 1 L’arlésienne de Georges Bizet, qui porte la date du 13 septembre 1900. Elle ne fut pas publiée avant 1950. Ce qui est assez curieux, c’est que Rachmaninov fit une seconde transcription du Menuet une vingtaine d’années plus tard, qui parut déjà en 1923: c’est la version enregistrée sur cet album. La première version possède des harmonies et des lignes mélodiques différentes, plus proches en fait du texte original de Bizet. Rachmaninov ne joua jamais sa première transcription pour piano seul en public. En 1908, il composa le premier acte d’un autre opéra inachevé: d’après Monna Vanna de Maeterlinck, œuvre qui n’existe que comme partition chorale, y compris le Prélude. Rachmaninov tenait en haute estime sa musique pour Monna Vanna, mais il ne réussit pas à la compléter à cause de difficultés contractuelles. Trois ans plus tard, en mars 1911, Rachmaninov écrivit sa Polka de W. R. (V. R. était son père Vassili, ou Wassily, Rachmaninov), une mélodie que son père jouait fréquemment au piano. On a cru assez longtemps que c’était un thème original de Rachmaninov père; en fait, il s’agit de la mélodie «Lachtäubchen» («La petite colombe riante») de Franz Behr, un célèbre compositeur de musique de salon du dix-neuvième siècle dont la valse «Les sylphes», jouissait d’une popularité certaine. C’est Behr qui est peut-être responsable de l’incertitude de l’origine du morceau: il se servit dans son rôle de compositeur de plusieurs pseudonymes anglais, francais, italiens, etc. Cette «transcription innocente» de la pièce fut publiée en 1911 dans un recueil de courts morceaux de compositeurs tels que Medtner, Scriabine et Taneïev. Rachmaninov réalisa le premier des ses nombreux enregistrements de cette pièce durant les premières sessions d’enregistrements pour Edison huit ans plus tard, ce qui montre son affection pour la bagatelle. Après son mariage en avril 1902, Rachmaninov composa un ensemble important de chansons, op.21: il les acheva à Lucerne pendant sa lune de miel. Huit ans après, à son retour en Russie après sa première tournée aux États-Unis, une dame inconnue (qui se révéla plus tard être Mme Fekle Rousseau) lui envoya un bouquet de lilas blancs. Elle signa la carte—«La dame aux lilas blancs»—. Ils ne se rencontrèrent jamais, Rachmaninov et elle, mais dorénavant elle lui envoya un tel bouquet avant chacun de ses concerts: même ceux qui eurent lieu à l’étranger. Des lilas et des roses ornaient le portail du manoir de Rachmaninov à Ivanovka. Ils fleurissaient pendant l’été idyllique de 1914. La transcription faite par Rachmaninov de sa mélodie Lilas, op.21 no 5, parut vers la fin de l’année, dans le sillage de la déclaration de guerre à la Russie par l’Allemagne le premier août. Aucun artiste ne pouvait éviter l’effet des incertitudes de la guerre; c’était un temps de recherche du temps perdu, un temps pour transcrire cette mélodie belle et signifiante. Rachmaninov l’enregistra aussi; mais en 1941 (dans des circonstances assez pareilles), il en fit une révision, qu’il enregistra également. Les modifications qu’il fit dans cette révision (enregistrée ici) sont négligeables—quelques notes çà et là, et six mesures différentes. Quelque soit la version, c’est un morceau obsédant. La première guerre mondiale était pour la Russie un désastre. Avant la fin de 1917, deux révolutions avaient occasionné la chute des Romanov et l’essor, sous Lénine, des Bolcheviques qui sortirent le pays de la guerre lors du Traité de Brest-Litovsk. L’ancien régime s’écroula, et avec lui, l’ambiance artistique qu’avait si bien connu Rachmaninov, sans compter son domaine familial. Il quitta la Russie avec sa famille et avec peu de ses possessions; après avoir vécu quelque temps en Scandinavie, ils arrivèrent à New York en novembre 1918, le jour de l’armistice. Il fit ses débuts comme résident américain un peu plus tard à Providence, Rhode Island. À un second concert à Boston, le 15 décembre, il introduisit son arrangement pour piano seul du «The Star-Spangled Banner» de John Smith. Il ne fut pas publié; le manuscrit est perdu, mais Rachmaninov l’enregistra pour la société Ampico en 1919, en même temps à peu près que les disques Edison contenant son seul enregistrement de la Rhapsodie hongroise no 2 de Liszt. Celle-ci comprend une cadenza transcrite de son enregistrement et publiée après sa mort. Il ne la coucha jamais en entier sur le papier. À partir de 1921, la carrière «renouvelée» de Rachmaninov comme virtuose ambulant était bien établie. Il enregistrait en ce temps exclusivement pour la compagnie Victor, à des condi­tions plus favorables que celles proposées par la compagnie Edison. Fritz Kreisler et John McCormack, qui étaient pareille­ment artistes pour Victor, enregistrèrent deux chansons de Rach­maninov avec violon obligé le 2 avril 1920. Rachmaninov était si enchanté du disque qu’il arrangea une chanson popu­laire russe pour McCormack et le célèbre Liebesleid de Kreisler («Chagrin d’amour») qu’il enregistra en 1921 pour Victor. Pres­que une année plus tard, il revint au Menuet de Bizet et enregistra sa seconde version; elle fut publiée en 1923 et témoi­gne d’une métamorphose vers un style pianistique plus sobre. La même année Rachmaninov transcrivit pour piano seul le Hopak tiré de l’opéra de Moussorgski La foire à Sorotchinski (Bizet et Moussorgksi firent des versions pour piano de leurs pièces), mais il ne le mit par écrit qu’en janvier 1924, après son premier enregistrement de la pièce (pour Ampico—le disque Victor date de 1925). Il arrangea aussi le Hopak pour violon et piano, sans doute pour Kreisler, mais cet arrangement reste toujours en manuscrit. Il est aussi probable que c’est en 1924 (le manuscrit ne porte aucune date) qu’il transcrivit Margaritki («Marguerites»), le troisième de son dernier recueil de chansons (op.38 de 1916), qui cite une phrase du second concerto pour piano. Cela devait être un morceau de bis; en 1925, Rachmaninov fit une transcription accom­pagnant Liebesleid, à savoir Liebesfreud de Kreisler, qu’il enregistra dans la même année. Kreisler rendit le compliment avec l’arrangement de Marguerites pour violon et piano. Ce fut en 1925 aussi qu’apparut la transcription du lied Wohin? de Schubert, extrait de Die schöne Müllerin, dont Rachmaninov donna la première à Stamford, Connecticut en octobre de cette année. En 1929, Rachmaninov fit ses derniers enregistrements sur rouleau Ampico: sa nouvelle transcription du Vol du bourdon de Rimski-Korsakov de l’opéra La légende du Tsar Saltan était comprise. Cela ne fut publié qu’en 1931, l’année ou il composa sa dernière œuvre pour piano seul, les Variations sur un thème de Corelli, op.42, dédiées à Kreisler. À cette période, Rachmaninov avait l’habitude de faire un arrangement pour piano seul, mais de ne pas le faire publier avant de l’avoir joué plusieurs fois en public. C’est ce qu’il fit en 1933 avec ses transcriptions suivantes, qui sont peut-être les plus célèbres—le Scherzo de Mendelssohn tiré de la musique de scène pour Un songe d’une nuit d’été et une suite de trois mouvements de la Partita en mi majeur pour violon seul de Bach. Après les transcriptions de Bach et de Mendelssohn, Rachmaninov cessa d’en produire. Il est possible qu’avec la radio et les disques, les temps avaient changé—en tout cas, ses derniers chefs-d’œuvre devaient l’occuper durant les années suivantes. Mais en 1934, il fit un arrangement du «Nunc dimittis» de ses Vêpres, op.37, qu’il fit reproduire en facsimilé dans un livre commémoratif, mais ce ne fut jamais publié. Il n’est pas sûr que Rachmaninov le destinait à une exécution en public. Lors du déclenchement de la seconde guerre mondiale, Rachmaninov était chez lui en Amérique. Des réminiscences—en particulier celles qui sont citées dans les Danses symphoniques de 1940, sa dernière composition originale—refont surface. Cette année, il commença la révision de plu­sieurs œuvres: le Moment musical, op.16 no 5, la Mélodie et la Sérénade de l’op.3 (nos 3 et 5) et l’Humoresque, op.10 no 5, datée du 3 mars. Comme la nouvelle version des Lilas, qui apparut plus tard, la plupart d’entre elles furent réalisées avant d’être enregistrées pour RCA Victor. L’année 1941 vit la guerre se répandre en Europe. Hitler déclencha l’invasion de la Russie le 22 juin; et Rachmaninov, profondément ému de voir sa patrie en guerre pour une seconde fois, décida de faire don du produit de ses concerts de cette saison à l’armée rouge. Qui ne penserait pas à sa patrie dans une telle situation? Et à sa jeunesse paisible? Cinquante-cinq années auparavant, dans un autre pays, un autre continent, un autre siècle, une autre ambiance, Rach­maninov, âgé de treize ans, avait débuté comme compositeur avec une transcription de Tchaïkovski—la Symphonie «Manfred», arrangée pour piano à quatre mains. Le 12 août 1941, le compositeur Rachmaninov, de renommée mondiale, acheva sa carrière avec une transcription pour piano seul de la Berceuse de Tchaïkovski, op.16 no 1. Les premiers enregistrements pour Edison comprenaient des transcriptions; de même, les derniers, en février 1942, comprenaient la Partita de Bach et une nouvelle version de Liebesfreud, ensemble avec des arrangements par Liszt et Tausig, et enfin avec sa version de la Berceuse de Tchaïkovski—rien que des transcriptions. Ainsi, la carrière de ce grand compositeur-pianiste débute et s’achève avec du Tchaïkovski et des transcriptions. RCA ne publia pas son enregistrement de la Berceuse avant 1973, où il faisait partie d’un album publié pour célébrer son centenaire, qui a réhabilité presque toute son œuvre, celle pour piano seul comprise. Depuis le centenaire de Rachmaninov, c’est devenu la règle plutôt que l’exception pour les pianistes qui se spécialisent dans la musique de l’époque de ce compositeur d’interpréter tous les concertos pour piano et orchestre de Rachmaninov. Parmi les plus doués de ces interprètes se trouve Zoltán Kocsis qui les a tous enregistrés en 1984; Kocsis a transcrit plus tard une des mélodies les plus célèbres, la Vocalise sans texte publiée à l’origine comme le no 14 de l’op.34 en 1916 (les treize autres chants de l’opus avaient été publiés trois ans auparavant). Il est assez surprenant que Rachmaninov n’ait jamais transcrit cette obsédante mélodie pour piano solo puisqu’il dut «l’essayer» d’abord au clavier et qu’il fit ensuite des transcriptions du thème pour soprano et orchestre et pour orchestre entier; il paraît aussi avoir donné son approbation à plusieurs autres. À bien des égards, la Vocalise représente la quintessence du genre mélodique de Rachmaninov, et cet enregistrement de Howard Shelley se termine fort à propos par un arrangement, en hommage au compositeur, exécuté par un autre excellent interprète. Als Sergej Rachmaninow im April 1873 geboren wurde, beanspruchte die Idee, permanente Tonaufzeichnungen zu erstellen, die Gedanken zweier bemerkenswerter—und voneinander unabhängig arbeitender—Erfinder: des Amerikaners Thomas Alva Edison und des Franzosen Charles Cros. Um die Zeit von Rachmaninows Tod, wenige Tage vor seinem 70. Geburtstag, war aus Cros’ Theorie und Edisons praktischer Forschung eine weltweite Industrie geworden, die schon damals stereophone Aufnahmetechnik, Langspielplatten sowie Band- und Drahtaufzeichnungen erschlossen hatte—obwohl diese Fortschritte bis nach dem Zweiten Weltkrieg auf ihre kommerzielle Auswertung warten mußten. Rachmaninow selbst hatte einiges übrig für moderne Erfindungen: im vorrevolutionären Rußland legte er sich ein Telefon und ein prächtiges Automobil zu, kam jedoch mit dem Telefon überhaupt nicht zurecht. 1919 nahm er seine erste Plattenaufnahme vor—in den USA und für den bewußten Thomas Edison, dem 1877 die erste praktische Aufzeichnung gelungen war. Kurz darauf ging Rachmaninow einen Exklusiv­vertrag mit Victor ein und wurde zum Grammophon-Enthusiasten. Er hätte wohl mehr Schallplatten aufgenommen, wenn nicht Charles O’Connell, der spätere Direktor für klassische Musik bei RCA Victor, eine persönliche Abneigung gegen ihn gehabt und viele Vorschläge des Künstlers abgelehnt hätte. Dessen ungeachtet bringt es Rachmaninows aufgezeich­neter Nachlaß (einschließlich Klavierwalzen) auf ungefähr 15 Stunden Spielzeit. Zu seinen Lebzeiten war er Zeuge der weltweiten Zunahme des passiven Unterhaltungskonsums im eigenen Heim geworden, denn Anfang der 40er Jahre waren neben die Plattenaufnahmen Rundfunksendungen als Medium unmittelbarer globaler Kommunikation getreten. 70 Jahre nach Rachmaninows Tod läßt sich gespeicherte Information schnell und relativ billig abrufen. Außer im Fall einer totalen Katas­trophe kann man sich heute nicht mehr vorstellen, ohne diese Mittel moderner Kommunikation auszukommen, doch der Welt, in die Rachmaninow hineingeboren wurde und in der er aufwuchs, mangelte es noch an derlei Einrichtungen. Ein Kind konnte seinerzeit Musik im wesentlichen nur dadurch kennenlernen, daß es sie selbst spielte. Neben Arran­gements für Soloklavier waren es im wesentlichen vierhändige Transkriptionen von Orchester- oder Kammermusik, über die Kinder und Erwachsene mit diesen Kompositionen vertraut gemacht wurden, denn Konzerte fanden relativ selten statt. Eine der frühesten Kindheitserinnerungen Rachmaninows betraf die Klavierduette, die er mit seinem Großvater Arkady gespielt hatte, der seinerseits als junger Mann bei dem irischen Pianisten und Komponisten John Field Unterricht genommen hatte. Als der 12jährige Sergej Rachmaninow auf Empfehlung seines Vetters Alexander Siloti (eines ehemaligen Liszt-Schülers) bei Nikolai Swerew am Moskauer Konservatorium Klavier zu studieren begann, gehörte es zur Musikerziehung des Jungen, mit seinen Mitschülern vierhändige Transkriptionen einzu­studieren. Der große Tschaikowsky hörte und lobte die Darbietungen, und im Sommer 1886 begann Rachmaninow (vermutlich angeregt durch dieses Lob, und ganz ohne Unter­weisung) seine erste Kompositionsarbeit. Es handelte sich um eine vierhändige Transkription von Tschaikowskys „Manfred“-Sinfonie, die damals gerade von Jurgenson herausgegeben worden war (die Sinfonie wurde am 11. März uraufgeführt: die Wahrscheinlichkeit ist groß, daß Rachmaninow dabei anwesend war). Die Transkription war eine musikalisch-hand­werkliche Übung, die der Junge als Ergänzung seiner Klavier­stunden und des Unterrichts in Harmonielehre brauchte. Rachmaninow und ein Mitschüler spielten Tschaikowsky die Transkription vor, und der Komponist muß von der Arbeit des Jungen beeindruckt gewesen sein. Ob dieser erste Versuch auch bei uns Anklang finden könnte, läßt sich nicht feststellen, denn die Transkription ist verschollen. Es lag also an seinen frühesten Begegnungen mit Musik, daß Rachmaninow Transkriptionen als normalen Aspekt des Musizierens erachtete. Einige Bearbeitungen seiner späteren Werke, die für „Transkriptionen“ gehalten wurden, sind in Wahrheit Originalversionen. Rachmaninow ging vor allem an seine Opern des öfteren so heran, daß er diese „Original­versionen“ orchestrierte—ein bei Opernkomponisten übliches Verfahren. Da Rachmaninow ein so hervorragender Pianist und Direktor der Bolschoi-Oper war, sind die von ihm veröffent­lichten Gesangspartituren seiner Opern von größerem Interesse als sonst—insbesondere die reinen Orchesternummern: Ouvertüren, Entreakte, Intermezzos oder Tänze. Ihre Klavier­auszüge nehmen einen hohen Rang ein, ähnlich den ersten Entwürfen des Komponisten. So plante der 15jährige Sergej Rachmaninow seine erste Oper Esmeralda, nach Victor Hugos Roman Notre-Dame de Paris, im Oktober 1888. Sie blieb unvollendet, doch die Introduktion zum 1. Akt und ein Entreakt (mit sonstiger Musik) sind als Klavierauszug erhalten. Drei Jahre später arrangierte Rachmaninow auf Silotis Vorschlag hin (und unter seiner Anleitung) Tschaikowskys Dornröschen für Klavier vierhändig. Das Werk kam 1892 heraus, im selben Jahr wie Rachma­ninows Gesangspartitur seiner Oper Aleko samt Introduktion, Intermezzo und Tänzen. 1892 schrieb er außerdem ein vierhändiges Klavierwerk, das zwei Jahre später erstmals in Orchesterform erschien: das Caprice bohémien, op. 12. Die Ansicht, daß die Klavierfassung eine Transkription sei, ist falsch, aber immerhin wurden die nächsten drei vierhändigen Kompositionen Rachmaninows nach der jeweiligen Orchesterversion erstellt, entsprechend der üblichen Praxis, Orchesterwerke als vierhändige Stücke zum Hausgebrauch zu publizieren. 1893 fertigte er eine vier­händige Version seiner Orchesterfantasie Der Felsen, op. 7; zwei Jahre später bearbeitete er seine unselige 1. Sinfonie (noch vor der einen mißlungenen Aufführung des Werks zu Rachmaninows Lebzeiten) sowie Glasunows 6. Sinfonie für Klavier vierhändig (ausgerechnet Glasunow sollte die glücklose Uraufführung von Rachmaninows Sinfonie im März 1897 dirigieren). Das Glasunow-Arrangement war Rachmaninows letzte vierhändige Transkription. Es wird häufig die Vermutung angestellt, der Mißerfolg seiner Sinfonie habe den Komponisten in eine Periode der Selbstzweifel gestürzt, aus der er erst drei Jahre später nach einer Serie hypnotherapeutischer Sitzungen herausfand. Aber Rachmaninows Dasein als ausführender Musiker war um diese Zeit derart hektisch, daß ihm wenig Zeit zum Komponieren blieb, selbst wenn er es gewollt hätte. Er lehnte mehrere Bitten um neue Werke ab, darunter auch den Auftrag für ein zweites Klavierkonzert, da sein Amt als Direktor des neu gegründeten Mamontow-Opernensembles den überwiegenden Teil seiner Zeit in Anspruch nahm—er dirigierte allein in der ersten Spielzeit sechs Opern, einschließlich der russischen Erstauf­führung von Bizets Carmen. Seine zunehmende internationale Anerkennung—zusätzlich geschürt durch den Ruhm seines Präludiums in cis-Moll—veranlaßte ihn, 1899 einer Einladung der Londoner Royal Philharmonic Society nachzukommen. Nach einem vielbeachteten Auftritt in der dortigen Queen’s Hall versprach er, in der nächsten Saison mit einem neuen Konzert wiederzukommen. Aber im folgenden Jahr, er hatte bereits einige kurze Stücke komponiert, wollte Rachmaninows Muse sich nicht einstellen; er war aus diversen Gründen deprimiert und erklärte sich zu einem Besuch bei Dr Nikolai Dahl bereit, einem führenden Hypnotherapeuten. Die Behandlung hatte Erfolg: Das neue Konzert war schon weit fortgeschritten, als Rachmaninow seine erste Transkription für Soloklavier vornahm. Diese Bearbeitung des Menuetts aus Bizets L’arlésienne-Suite Nr. 1 trägt das Datum 13. September 1900, wurde jedoch erst 1950 veröffentlicht. Erstaunlich ist, daß Rachmaninow über 20 Jahre später eine weitere Transkription des Menuetts erstellte, die 1923 herauskam. Es ist die zweite Transkription, die hier eingespielt wurde. Die erste unterscheidet sich von ihr hinsichtlich Harmonik und Melodielinie—sie ist Bizets Original wesentlich ähnlicher. Rachmaninow hat seine erste Transkription für Solo­klavier nie vor Publikum aufgeführt. 1908 komponierte er den ersten Akt eines weiteren unvollendeten Opernprojekts nach Maeterlincks Monna Vanna, der mitsamt seinem Präludium nur als unveröffentlichter Klavierauszug erhalten ist. Rachma­ninow hielt große Stücke auf seine Monna Vanna-Musik, doch vertragsrechtliche Probleme verhinderten die Vollendung des Werks. Drei Jahre später schrieb Rachmaninow im März 1911 seine Polka de W. R. (gemeint ist Wassili Rachmaninow, sein Vater)—auf eine Melodie, die der Vater oft auf dem Klavier gespielt hatte. Jahrelang wurde angenommen, daß dieses Thema von Rachmaninow senior stammt. Tatsächlich handelt es sich jedoch um das „Lachtäubchen“ von Franz Behr, einem berühmten Salonkomponisten des 19. Jahrhunderts, dessen Walzer „Les sylphes“ äußerst populär war. Möglicherweise trägt Behr selbst die Schuld an der ungewissen Vorgeschichte des Werks: Er benutzte mehrere Pseudonyme—englische, französische, italienische und andere—für seine Musik. Rachmaninows „ungewollte“ Transkription kam 1911 in einem Band mit kurzen Stücken heraus, zu dem Medtner, Skrjabin und Tanejew beigetragen hatten; die erste von mehreren seiner Einspielungen des Werks besorgte Rachmaninow acht Jahre später während der ersten Aufnahmetermine für Edison und bewies damit seine Vorliebe für diese musikalische Bagatelle. Nach seiner Eheschließung im April 1902 brachte Rachma­ninow als op. 21 eine bedeutende Serie von Liedern heraus, die er während seiner Flitterwochen in Luzern vollendet hatte. Weitere acht Jahre später, bei seiner Rückkehr nach Rußland im Anschluß an seine erste Amerikatournee, schickte ihm eine unbekannte Dame (die später als Madame Fekle Rousseau identifiziert wurde) einen weißen Fliederstrauß. Die beigelegte Karte unterschrieb sie mit den Worten „Die Dame mit dem weißen Flieder“. Die beiden begegneten sich nie, aber sie schickte ihm fortan zu jedem seiner Konzerte das gleiche Bouquet—selbst wenn sie im Ausland stattfanden. Flieder und Rosen schmückten das Tor, das zum Vorder­eingang von Rachmaninows Landhaus in Iwanowka führte. Die Blumen blühten wunderschön im idyllischen Sommer des Jahres 1914. Rachmaninows Transkription von Flieder—dem fünften Lied der Serie op. 21—erschien Ende des Jahres, nachdem Deutschland am 1. August Rußland den Krieg erklärt hatte. Kein Künstler hätte unberührt bleiben können von den Unge­wißheiten, die der Ausbruch von Kampfhandlungen mit sich brachte; dies war der rechte Zeitpunkt, um sich zu besinnen, um dieses bedeutungsvolle und schöne Lied für Klavier zu bearbeiten. Rachmaninow nahm seine Transkription auch auf, aber 1941 schuf er (unter ähnlichen Bedingungen) eine zweite transkribierte Version, die ebenfalls aufgezeichnet wurde. Bei der hier eingespielten zweiten Version fallen Rach­maninows Veränderungen geringfügig aus: ein paar Noten hier und dort und sechs umgestellte Takte. In beiden Fassungen handelt es sich um ein Stück, das einem nicht mehr aus dem Kopf geht. Der Erste Weltkrieg ging für Rußland böse aus: Ende 1917 hatten zwei Revolutionen zum Niedergang der Romanows und zum Erstarken der Bolschewiken unter Lenin geführt, der mit dem Vertrag von Brest-Litowsk das Land vom Krieg befreite. Die alte Ordnung wurde aufgehoben, und mit ihr Rachmaninows vertrautes künstlerisches Milieu—vom Verlust seines Landhauses ganz zu schweigen. Mit seiner Familie und wenigen Habseligkeiten reiste er aus Rußland aus; nachdem er sich einige Zeit in Skandinavien aufgehalten hatte, traf er am Tag des Waffenstillstands am 11. November 1918 in New York ein. Rachmaninow gab sein erstes Konzert nach seiner Ankunft in den USA im selben Monat in Providence im Bundesstaat Rhode Island. Bei einem zweiten Konzert in Boston am 15. Dezember spielte er zum ersten Mal sein Arrangement für Soloklavier von John Smiths „The Star-Spangled Banner“. Es wurde nie veröffentlicht, da das Manuskript verlorenging, aber Rachma­ninow zeichnete es 1919 für die Pianola-Firma Ampico auf Walze auf, ungefähr um die gleiche Zeit wie die Edison-Schallplatten, auf denen unter anderem seine einzige Ein­spielung von Liszts Ungarischer Rhapsodie Nr. 2 zu hören ist. Die Liszt-Rhapsodie enthält eine Kadenz, die von der Schallplatte abgeschrieben und nach Rachmaninows Tod publiziert wurde. Er selbst hatte sie nie vollständig notiert. 1921 war Rachmaninows „neue“ Karriere als reisender Klaviervirtuose fest begründet; er nahm nun ausschließlich für die Firma Victor auf (unter besseren Bedingungen, als Edison zu bieten hatte). Fritz Kreisler und John McCormack, die ebenfalls bei Victor unter Vertrag standen, nahmen am 2. April 1920 zwei Lieder des Komponisten mit Violinobligato auf; Rachmaninow war von der Schallplatte so angetan, daß er ein russisches Volkslied für McCormack arrangierte und Kreislers berühmtes Liebesleid für Soloklavier bearbeitete, um es 1921 für Victor einzuspielen. Fast ein Jahr später wandte er sich zum zweiten Mal Bizets L’arlésienne zu und erstellte seine zweite Version, die wie gesagt 1923 veröffentlicht wurde. Die Neufassung zeigt, daß der Komponist damals zu einem sparsameren Klavierstil tendierte. Noch im selben Jahr (1923) transkribierte Rachmaninow den Hopak aus Mussorgskys Oper Der Jahrmarkt von Sorotchinsky für Soloklavier (sowohl Bizet als auch Mussor­g­sky hatten Klavierfassungen ihrer eigenen Werke erstellt) schrieb ihn jedoch erst im Januar 1924 nieder—nachdem er ihn für Ampico aufgenommen hatte (seine Schallplatte für Victor entstand 1925). Rachmaninow bearbeitete den Hopak außerdem für Violine und Klavier, wobei er zweifellos an Kreisler dachte, aber dieses Werk blieb unveröffentlicht. 1924 transkribierte er möglicherweise (die Urschrift ist undatiert) auch Gänseblümchen—das dritte Lied seiner letzten Serie (op. 38 von 1916)—in dem eine Phrase aus dem 2. Klavierkonzert anklingt. Es mag sich dabei um ein Zugabestück gehandelt haben. 1925 bearbeitete Rachmaninow das Gegen­stück zu Liebesleid, Kreislers Liebesfreud, und nahm es noch im selben Jahr auf. Kreisler erwiderte das Kompliment, indem er Rachmaninows Gänseblümchen für Violine und Klavier arrangierte. 1925 kam außerdem Rachmaninows Transkription von Schuberts Wohin? aus dem Zyklus Die schöne Müllerin heraus, die er zum ersten Mal im Oktober des Jahres bei einem Konzert in Stamford, Connecticut, vortrug. 1929 nahm Rachmaninow die letzten Walzen für Ampico auf, so unter anderem seine neue Transkription von Rimskij-Korsakows Hummelflug aus der Oper Das Märchen vom Zaren Saltan. Diese wurde erst 1931 publiziert, im selben Jahr wie Rachmaninows letzte Originalkomposition für Soloklavier, die Variationen auf ein Thema von Corelli, op. 42, die er Kreisler widmete. Um diese Zeit hatte Rachmaninow sie Angewohnheit, ein Arrangement für Soloklavier zu schaffen und es dann nicht zu veröffentlichen, bis er es mehrmals bei öffentlichen Anlässen gespielt hatte. So verfuhr er auch 1933 mit seinen nächsten und wahrscheinlich berühmtesten Arrangements, der Bearbei­tung des Scherzos als Mendelssohns Bühnenmusik zum Sommernachtstraum und der Transkription einer dreisätzigen Suite aus Bachs Violinpartita in E-Dur. Mit seinen Bach- und Mendelssohn-Transkriptionen hörte Rachmaninows Tätigkeit als Arrangeur praktisch ganz auf. Vielleicht deuteten die Fortschritte der Rundfunk- und Aufnahmetechnik an, daß sich die Zeiten geändert hatten; jedenfalls sollte er während der nächsten Jahre mit seinen letzten eigenen Meisterwerken beschäftigt sein. Aber dann schrieb er 1934 eine Version für Soloklavier des „Nunc dimittis“ aus seiner Vesperliturgie, op. 37, die in Faksimile in einem Band mit Reminiszenzen erschien, jedoch nie getrennt publiziert wurde; es ist ungewiß, ob sie je zur öffentlichen Aufführung gedacht war. Bei Ausbruch des Zweiten Weltkriegs hielt sich Rach­maninow daheim in Amerika auf; alte Erinnerungen—namentlich jene, die in seine letzte Komposition eingingen, die Sinfonischen Tänze von 1940—stellten sich aufs neue ein. Das Jahr hatte mit Bearbeitungen mehrerer Originalwerke begonnen: des Moment musical, op. 16 Nr. 5, der Mélodie und Sérénade aus op. 3 (Nr. 3 und 5) sowie, datiert auf den 3. März, seiner Humoresque, op. 10 Nr. 5. Wie die Neufassung von Flieder, die später erschien, ging die Mehrzahl dieser Bearbeitungen Rachmaninows jeweiligen Einspielungen für RCA Victor voraus. 1941 breitete sich der Krieg rasch in ganz Europa aus. Hitler befahl am 22. Juni den deutschen Einmarsch nach Rußland, und Rachmaninow—in tiefer Sorge, weil sich sein Land schon wieder im Krieg befand—faßte den Entschluß, die Einkünfte aus seiner bevorstehenden Konzertsaison der Roten Armee zukommen zu lassen. Wer hätte in so einer Zeit nicht an sein Heimatland gedacht? An die prägenden Friedensjahre, die man dort verbracht hat? 55 Jahre zuvor—in einem anderen Land, auf einem anderen Kontinent, in einem anderen Kulturkreis, in einem anderen Jahrhundert hatte der 13jährige Sergej Rachmaninow seine Komponistenlaufbahn mit der Transkription eines Werks von Tschaikowsky begonnen, der Sinfonie „Manfred“ für Klavier zu vier Händen. Und am 12. August 1941 beendete der weltberühmte Sergej Rachmaninow seine Komponistenlaufbahn mit einer Transkription für Solo­klavier von Tschaikowskys Wiegenlied (op. 16 Nr. 1). Rachmaninows erste Aufnahmen für Thomas Edison umfaßten auch Transkriptionen; und bei seinen letzten Studio­terminen im Februar 1942 spielte er neben Arrangements von Liszt und Tausig seine Bach-Suite und eine Neufassung von Liebesfreud—und zuletzt seine Version von Tschaikowskys Wiegenlied: ausnahmslos Transkriptionen. So begann und endete die Komponisten- und Schallplattenkarriere dieses bedeutenden Künstlers mit Tschaikowsky—und mit Trans­kriptionen. Rachmaninows Aufzeichnung der Wiegenlied-Transkription wurde von RCA zurückgehalten, bis sie 1973 als Teil eines Gedenkprogramms zu seinem 100. Geburtstag herauskam. Die Feierlichkeiten aus diesem Anlaß haben seither zur Neubelebung des Interesses für fast alle Musik Rachmaninows geführt. Das betrifft auch die Musik für Solo­klavier, das Instrument das der Komponist so unvergleichlich beherrschte. Seit den Feiern zu Rachmaninows 100. Geburtstag ist es für Pianisten, die sich auf die Musik seiner Zeit spezialisiert haben, üblich geworden, sämtliche Rachmaninow- Konzerte für Klavier und Orchester aufzuführen. Zu den begnadeteren dieser Interpreten zählt Zoltán Kocsis, der sie 1984 eingespielt hat; später transkribierte Kocsis eine der berühmtesten Melodien des Komponisten, die wortlose Vocalise, die ursprünglich 1916 als op. 34 Nr. 14 veröffentlicht wurde (die übrigen 13 Lieder des Opus waren drei Jahre zuvor erschienen). Rachmaninow hat diese ergreifende Melodie nie für Soloklavier bearbeitet, was einigermaßen überrascht, da er sie gewiß zunächst am Klavier „ausprobiert“ haben würde, zumal er selbst Transkriptionen des Themas für Sopran und Orchester sowie für volles Orchester erstellt und offenbar mehrere andere Bearbeitungen gutgeheißen hat. In vielerleiz Hinsicht ist die Vocalise die Quintessenz von Rachmaninows melodischem Genie, und mit dieser Huldigung an den Komponisten, von einem ausgezeichneten Rachmaninow-Pianisten arrangiert und von einem zweiten gespielt, findet Howard Shelleys Einspielung einen würdigen Ausklang.